After studying a BA Hons in Printmaking and Sculpture at West Surrey College of Art and Design. Janet went on to the Slade School of Fine Art where she received an MA in Printmaking – specializing in Mezzotint and Lithography – mentored by Stanley Jones MBE. During the MA she lectured at her previous college in Printmaking and ran Mezzotint courses at locations such as the Ruskin School of Drawing. On graduating from the Slade her first solo exhibition was at the Curwen Gallery, London, and she was a gallery artist with them for many years, Awards included the Lloyds Young Printmaker and Elizabeth Greenshield Award which helped her to progress in her early work. Janet went on to a long and successful career with the publisher London Contemporary Art, where she made hand drawn lithographs and silkscreens, becoming internationally known for her figurative work – exhibiting regularly in the USA, Moscow, and Japan amongst others. 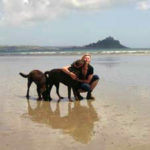 Janet now resides in West Cornwall as a self-publishing Artist – her work inspired by the beautiful magical west-coast environment where she lives and works.